QBI Deduction. Explains the ins and outs of the new Section 199A deduction for Qualified Business Income (QBI), including how to help your clients take advantage of and maximize the deduction. Includes a worksheet so you can easily compute and project the deduction. Kiddie Tax. Shows you how to help your clients shelter more of a child's investment income under the new Kiddie Tax rules. Business Meal and Entertainment Expenses. Addresses how the rules have changed so you can help your clients navigate them and minimize any lost deductions. Tax rules change from year to year, and sometimes drastically. Whether it’s simply rates and amounts or the addition or expiration of new tax provisions, keeping ahead of clients is a challenge for any tax practitioner. And, many clients expect more from their tax practitioner than just preparing their tax returns. They want their practitioner to alert them to tax-saving ideas or simply be ready when they call with questions throughout the year. The Tax Planning for Individuals Quickfinder Handbook provides quick answers to a broad range of individual tax planning topics. 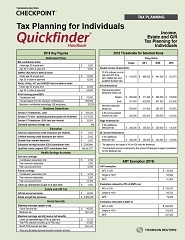 Unlike other tax planning publications, this Handbook presents the material using Quickfinder’s unique quick reference format that uses many charts, tables and examples plus plain-language descriptions of the tax-saving strategies.